(1976) "I Wanna Be Your Boyfriend"
"Blitzkrieg Bop" is a song by the American punk rock band Ramones. It was released as the band's debut single in February 1976 in the United States. It appeared as the opening track on the band's debut album, Ramones, that was released April 23, 1976. The song, whose composition was credited to the band as a whole, was written by drummer Tommy Ramone (music and lyrics) and bassist Dee Dee Ramone (lyrics). Based on a simple three-chord pattern, "Blitzkrieg Bop" opens with the chant "Hey! Ho! Let's go!" The song is popular at sporting events where "Hey! Ho! Let's go!" is sometimes shouted as a rallying cry. "Blitzkrieg Bop" is number 92 on the Rolling Stone list of The 500 Greatest Songs of All Time. In March 2005, Q magazine placed it at number 31 in its list of the 100 Greatest Guitar Tracks, and in 2008 Rolling Stone placed it number 18 of the top 100 Greatest Guitar Songs of All Time. In 2009 it was named the 25th greatest hard rock song of all time by VH1. "Blitzkrieg Bop" was named after the German World War II tactic blitzkrieg, which means "lightning war". The song was mainly written by drummer Tommy Ramone, while bassist Dee Dee Ramone came up with the title (the song was originally called "Animal Hop"). Dee Dee also changed one line: the original third verse had the line "shouting in the back now", but Dee Dee changed it to "shoot 'em in the back now". The precise meaning and subject matter of the song is, unlike many of The Ramones' other early compositions, somewhat vague and obscure. Tommy Ramone tells about the chant in Ramones: Soundtrack Of Our Lives, written by Jari-Pekka Laitio-Ramone: "I came up with the chant walking home from the grocery store carrying a bag of groceries. It was based on the line: 'High Hose nipped her toes' from the song, "Walking The Dog" by Rufus Thomas." "Blitzkrieg Bop" is a 4/4 time song written in the key of A. It contains four chords; A major (I), B minor (ii), D major (IV), and E major (V). The song relies heavily on the I, IV, and V chords, most notably used in the intro and verses in the form of the I–IV–V chord progression. The ii chord appears only briefly towards the end of the refrain. Johnny Ramone played the entire song with barre chord shapes, as these were signature to his playing style. Dee Dee Ramone simply played the root note of whatever chord the guitarist was playing. Both the rhythm guitar and bass parts, played using downstrokes exclusively, utilize almost constant eighth notes to generate a "wall of sound". Joey Ramone's vocal melody relies on five of the seven notes found in the A major scale; A, B, C♯, D, and E. Tommy Ramone maintains a steady backbeat on the kick and snare throughout the entire song. Constant eighth notes are played on the hi hat cymbals during the verses, and on the floor tom whilst Joey shouts "Hey, Ho, Let's Go! ", whereas quarter notes are used on the ride cymbal during the refrain. Occasional crashes are used to accentuate certain beats. The song was originally played at a very fast tempo (roughly 177 bpm). When the band performed the song live, they started to play it at even faster tempos, gradually increasing the speed throughout their career. At the band's final show, they played the song at an extremely fast tempo well above 200 bpm. The punk rock band Blitzkrieg Bop took their name after the song title. A monthly club night at the Arches in Glasgow was named after the song. The song was featured in the trailer of the 2012 stop-motion animated film The Pirates! Band of Misfits. The song appeared in the video games MLB 08: The Show, Rock Band, Rocksmith 2014, NHL Slapshot, NHL 11 and NBA 2K16. The song was used as a battle hymn in the first episode of the sci-fi/action TV series, Space: Above and Beyond. The song was used in the ESPN series The Bronx is Burning. 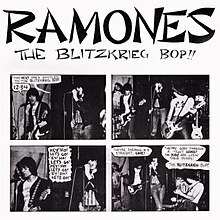 "Blitzkrieg Bop" has been heard in numerous TV advertisements including The Amazing Race, Coppertone, Peloton, Anthony Bourdain: Parts Unknown, AT&T, ao.com, BIGBON, Cartoon Network, and Taco Bell. A remastered version of "Blitzkrieg Bop" appears on the soundtrack of Tony Hawk's Pro Skater 3. The song is regularly played before home games at St. James' Park, home of Newcastle United F.C. "Blitzkrieg Bop" was featured in a 2004 episode of The King of Queens, "Icky Shuffle". Frequent references to the song are made in the novel Pet Sematary and the film Final Destination 3. A rendition of the song is chanted in Pan by Blackbeard's crew of pirates. Justin Long covered/karaoked the song in Accepted (2006). ^ Bradley, Michael (March 15, 2016). "The 10 best punk rock singles, by The Undertones' Michael Bradley". TeamRock. Retrieved February 12, 2017. ^ Robinson, Joe (January 23, 2013). "10 Best Pop-Punk Songs". Diffuser.fm. Retrieved January 11, 2019. ^ Laitio-Ramone, Jari-Pekka (October 1, 1997). "Something about the Ramones history". Something about the Ramones history. Jari-Pekka Laitio-Ramone. Retrieved 2016-01-01. ^ Bessman (1993), p. 48. ^ "500 Greatest Songs of All Time: Ramones, 'Blitzkrieg Bop'". Rolling Stone. Retrieved 28 September 2016. ^ "Rolling Stone's 100 Greatest Guitar Songs Of All Time". Rolling Stone. Retrieved 25 October 2016. ^ "VH1 Top 100 Hard Rock Songs". Spreadit Music. Archived from the original on February 12, 2009. Retrieved February 7, 2009. ^ Laitio-Ramone, Jari-Pekka (May 19, 2009). "Ramones: Soundtrack Of Our Lives". Blitzkrieg Bop's chant. Jari-Pekka Laitio-Ramone. Retrieved 2016-01-01. ^ a b c Hal Leonard (2001). Ramones Guitar Anthology. Hal Leonard Publishing. ISBN 978-0-7692-0594-6. ^ a b Ubisoft. Rocksmith 2014. ^ a b c Jim Bessman (May 15, 1993). Ramones: An American Band. St. Martin's Griffin. p. 13. ISBN 978-0-312-09369-3. ^ Michael Molenda. The Guitar Player Book: 40 Years Of Interviews, Gear, And Lessons From The World's Most Celebrated Guitar Magazine. Backbeat Books. p. 71. ISBN 978-0-87930-782-0. ^ Nunneley, Stephany (July 24, 2015). "Get your groove on with the official NBA 2K16 soundtrack". VG247. Retrieved April 16, 2016. ^ "Cartoonnetwork lets go". December 10, 2009. Retrieved August 15, 2017. ^ "Routine Republic" 2015 Taco Bell Breakfast Short Film. Youtube.com. 2015. Retrieved 2015-09-30. ^ ""The King of Queens" Icky Shuffle (TV Episode 2004)". IMDb.com, Inc. Retrieved 6 December 2018. ^ ""The King of Queens" Icky Shuffle (TV Episode 2004) - Soundtracks". IMDb.com, Inc. Retrieved 6 December 2018. ^ "British album certifications – RAMONES – Blitzkrieg Bop". British Phonographic Industry. Select albums in the Format field. Select Silver in the Certification field. Type Blitzkrieg Bop in the "Search BPI Awards" field and then press Enter. ^ "American album certifications – RAMONES – Blitzkrieg Bop". Recording Industry Association of America. If necessary, click Advanced, then click Format, then select Album, then click SEARCH. "I Wanna Be Your Boyfriend"
"Now I Wanna Sniff Some Glue"
"Sheena Is a Punk Rocker"
"I Just Want to Have Something to Do"
"Do You Remember Rock 'n' Roll Radio?" "The KKK Took My Baby Away"
"Somebody Put Something in My Drink"